Many computer vision tasks require inferring a missing high-resolution image from the low-resolution input, which was introduced as face hallucination. This technique has many applications in image enhancement, image compression and face recognition. It can be especially useful in a surveillance system where the resolution a of face image is normally low in video, but the details of facial features which can be found in a potential high-resolution image may be crucial for identification and further analysis. However, hallucinating faces is challenging because people are so familiar with the face. A small error might be significant to human perception, whereas for super resolution of generic images the errors in textured regions are often overlooked. 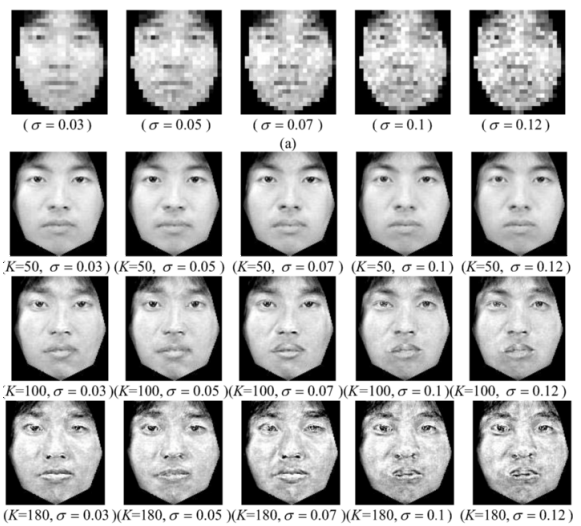 This specialized perception of faces requires that a face synthesis system be accurate at representing facial features. We use the high-resolution images from face hallucination to conduct efficient face recognition tasks. X. Wang and X. Tang, IEEE Trans. on System Man and Cybernetics (SMC), Part C, Vol. 35, No. 3, pp. 425-434, 2005. In video surveillance, the faces of interest are often of small size. Image resolution is an important factor affecting face recognition by human and computer. In this paper, we propose a new face hallucination method using eigentransformation. Different from most of the proposed methods based on probabilistic models, this method views hallucination as a transformation between different image styles. We use Principal Component Analysis (PCA) to ?t the input face image as a linear combination of the low-resolution face images in the training set. The high-resolution image is rendered by replacing the low-resolution training images with high-resolution ones, while retaining the same combination coef?cients. Experiments show that the hallucinated face images are not only very helpful for recognition by humans, but also make the automatic recognition procedure easier since they emphasize the face difference by adding more high-frequency details. X. Tang and X. Wang. In Proceedings of the 4th International Conference on Audio- and Video-Based Person Authentication (AVBPA), Guildford, UK, June 2003. 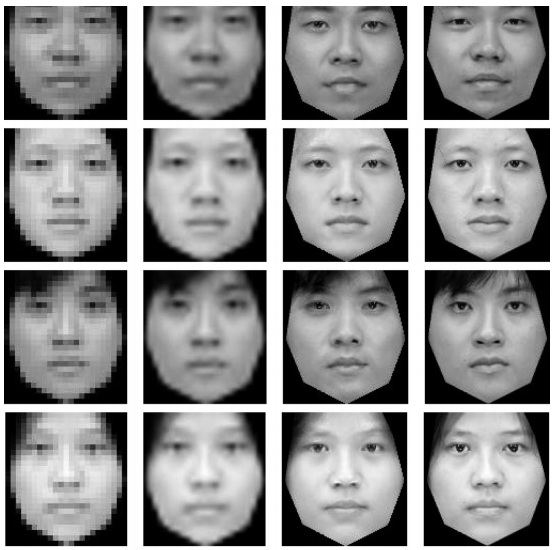 In this paper, we study the face recognition performance using different image resolutions. For automatic face recognition, a low resolution bound is found through experiments. We use an eigentransformation based hallucination method to improve the image resolution. The hallucinated face images are not only much helpful for recognition by human, but also make the automatic recognition procedure easier, since they emphasize the face difference by adding some high frequency details.